Whirligigs are moved by the wind,whirling and turning on a pivot. As The Wooden Man, we have been making these fun devices since 1984. 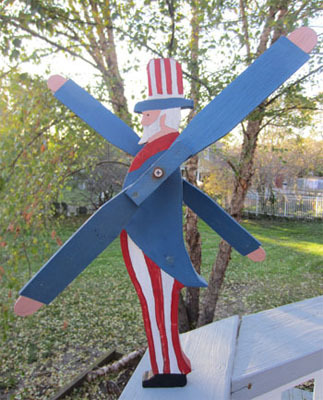 Our original Uncle Sam Whirligig is now 33 years old and only needs a little oil once in a great while to keep him spinning and turning quietly again. US Whirligigs uses only select grade #1 pine for the body, combined with oak and birch. We offer our products unfinished, primed or completely finished. All of our whirligigs come complete with all the parts needed to get them spinning right out of the box. We are a small family business which is proud to offer products made in the US!